Credit: X-ray: NASA/CXC/RIT/J.Kastner et al. ; Optical: NSF/NOAO/KPNO/A.Block et al. The X-ray/optical comparison of the region surrounding McNeil's Nebula shows that the position of a source detected by Chandra is coincident with that of a bright infrared and optical source at the apex of the nebula.Source 3, thought to be a very young star, is illuminating the fan-shaped cloud of gas, or nebula. 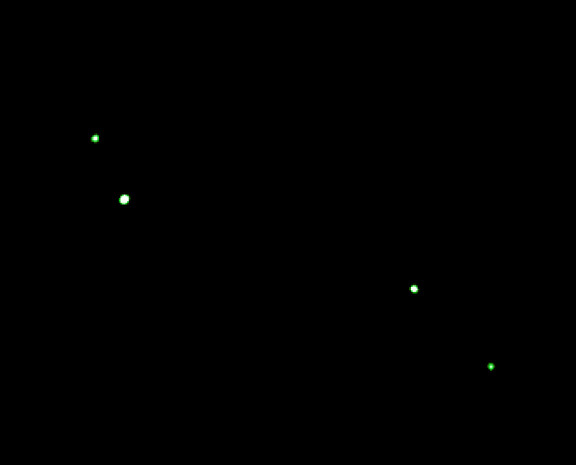 The others sources in the field, labeled 1, 2, and 4, are other young, X-ray emitting stars in the region. The small nebula, which lies in the constellation Orion about 1300 light years from Earth, was discovered with a 3-inch telescope by amateur astronomer Jay McNeil in January 2004. A young star buried deep in a cloud had brightened suddenly, illuminating the nebula. The coincident X-ray source was also observed to brighten fifty-fold as measured in Chandra observations obtained before and just after the optical outburst. The X-ray data are strong evidence that the probable cause of the outburst is the sudden infall of matter onto the surface of the star from an orbiting disk of gas. The coupling of the magnetic field of the star and the magnetic field of its circumstellar disk regulates the inflow of gas from the disk onto the star. This slow, steady inflow suddenly can become much more rapid if a large amount of gas accumulates in the disk, and the disk and the star are rotating at different rates. The differing rotation rates can twist and shear the magnetic field, storing up energy. This energy is eventually released in an energetic, X-ray producing outburst as the magnetic field violently rearranges back to a more stable state. During this period, a large amount of gas can fall onto the star, producing the observed optical and infrared outburst. A new buildup of gas in the disk could lead to a new outburst in the future. 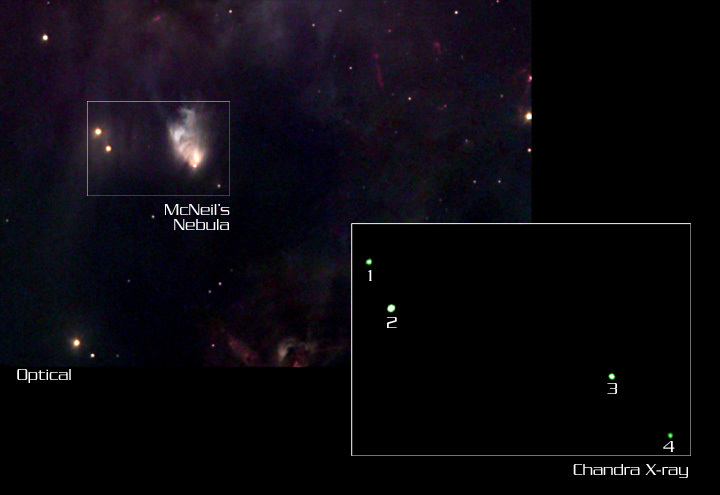 Such a scenario may explain why the brightness of McNeil's Nebula appears to vary with time. It appears in optical images taken of this region of Orion in the 1960s, but is absent from images taken in the 1950s and 1990s. Credit X-ray: NASA/CXC/RIT/J.Kastner et al. ; Optical: NSF/NOAO/KPNO/A.Block et al. Scale Image is 135 x 90 arcsec across. Coordinates (J2000) RA 05h 46m 13.10s | Dec -00° 06´ 05.00"